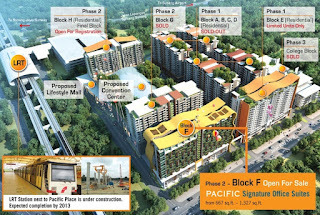 Pacific Place @ Ara Damansara is a mixed development project by Island Circle Development located in Petaling Jaya, Selangor. Pacific Place consists of three phases. Phase One comprising 6 serviced apartment blocks of 15-storey buildings. There are 1,200 apartment units in total. Built-up area ranging from 717 sq.ft. to 1,325 sq.ft. with various layout design to choose from. Phase Two is the Signature Office Suite and Lifestyle Mall while phase three consists of College Block.